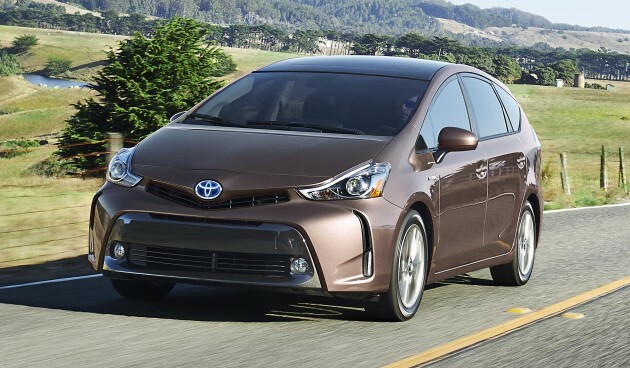 The Toyota Prius v facelift has been unveiled at the 2014 Los Angeles motor show, sporting a more aggressive face in an effort to keep itself relevant. If you’re experiencing a bout of déjà vu, fret not. The same model in Europe – known as the Prius+ – received the same treatment just early last month. Of all the changes, the adoption of a much fiercer front end comprised of a restyled grille and front bumper along with a new headlight design – with optional LED-projector headlight for both low- and high-beams – is the most obvious. Rear changes include a refreshed rear lamp design and a new rear diffuser. In terms of hardware, Toyota’s Hybrid Synergy Drive features a 1.8 litre, Atkinson-cycle four-cylinder engine paired to an electric motor. Total power output equates to 134 hp and fuel consumption is rated at an EPA-estimated 17 km/l for city runs and 18.7 km/l for highway stints. Safety is at the forefront of Toyota’s mind with the inclusion of the company’s Star Safety System™ umbrella. Safety aids such as vehicle stability control (VSC), traction control, anti-lock braking system (ABS), electronic brake-force distribution (EBD), Brake Assist and seven airbags. UMW sell what stupid Previa Alphard lar? Bring in this Prius V is more practical and economical for Malaysian family! Since UMW didn’t brought the older 2012 Prius V into Malaysia market, It’s highly unlikely that they will bring it into Malaysia now. The older 2012 version was very comfortable, they are used as cabs in Japan and I had the privilege of renting one on my trip from Sapporo to Biei in the summer, the ride and seat is far more comfortable than my 2010 facelift Camry. There is power from the electric motor when I’m going uphill and the car is surprisingly quiet and composed than my Camry. Hoping to find one in the grey dealers that doesn’t break my bank, the older 2012/13 ones is fine with me as well. ok, let me say some nice thing. Typo detected: 18.7kml for city but highway only 17kml? And its VSC instead of VCS, (Vehicle stability control). Next Post: AD: Last batch of Volkswagen Polo GTIs set to fly fast with rebates of up to RM30k, only at Cergaz Autohaus!